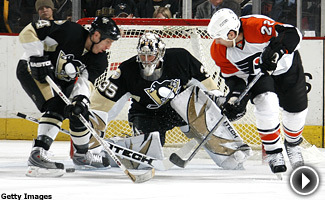 The Philadelphia Flyers visit the Pittsburgh Penguins this Sunday at the Mellon Arena for NBC's NHL "Game of the Week". Think of the NHL as a big family that squabbles a lot but is bound together by love and tradition. Sure, they sometimes drop the gloves or rub them in each other's faces, but what brothers don't? Ray Shero is the general manager of the Penguins. Bob Clarke is the former general manager and star player for the Flyers. Ray's dad, the late Fred Shero, coached Clarke from 1971-1978, winning Stanley Cups in 1974 and 1975. Under Shero, Clarke won the 1972 Masterton Trophy and the 1973, 1975 and 1976 Hart trophies. Fred Shero won the 1974 Jack Adams Award as the NHL's best coach. Bud Poile, the Flyers' first general manager, hired Keith Allen, who replaced Poile as GM and hired Shero as coach. Ray Shero recalls skating at Flyers practices with Clarke, Rick MacLeish, Bernie Parent and the rest of the “Broad Street Bullies” in the 1970s. It was a thrill for him and he soaked up every tip the pros were willing to share. He was well liked by the older players, Clarke said. "What I remember best about him was that the little bugger could really skate," Clarke said. "We used to have a lot of kids skating with us before or after practices. Reggie Leach's son was out there, and in later years my son would skate. We always had our kids around the dressing room and we liked that." "I used to skate with Bernie Parent's son, Chuck, at practice, and Mr. Snider's son, Jay, who went on to play goal at the University of Pennsylvania," Shero recalled. "My dad took me to the awards ceremony the year Mr. Clarke -- I always called him Mr. Clarke then -- won his first Hart Trophy," Shero said. "I was 13-years-old. My dad took a picture, and I still have it, of me and Bobby with the trophy and we're sharing a toast. He's drinking champagne and I'm drinking milk. "It's neat all these years later to still see a lot of those players. I see 'Chief' Bobby Taylor every time we play the Tampa Bay Lightning because he's a broadcaster with them. Same thing with Terry Crisp, who is a broadcaster for the Nashville Predators, where I used to work. My wife, Karen, and I are very good friends with Terry and his wife, Sheila. I still see Moose Dupont all the time. It was fun growing up around those guys." "Not just Ray, but anybody who played on those teams back then, we kept an eye out for each other's kids," Clarke said. "Some of them wound up working for the Flyers. The team has always been good about giving ex-players jobs and helping their families. Ray had a very nice career at St. Lawrence (University). He was a good college-hockey player. I think he went to another team's training camp and then he went to Hershey with our minor-league team. Then he got into the administrative end of the business. I've watched Ray's career from afar and have always been pulling for him. He's done well." "Bobby Clarke was my idol as a kid," Shero said. "He treated me great. I have fond memories of the Flyers organization. But now that I'm with the Penguins, it's different. It's a great rivalry, great competition. We do everything we can to beat each other, but at the end of the day, we're friends. Flyers GM Paul Holmgren played for my father. I have a lot of respect for a lot of the people in that organization. Shero played his youth hockey in Philadelphia, and then went to New Hampton Prep in New Hampshire followed by four years at St. Lawrence. He was captain for two years on a team that included Randy Sexton, the Florida Panthers' assistant general manager. Shero worked for seven years with player agent Steve Bartlett and then was hired in 1993 to be the assistant to Sexton, who was the Ottawa Senators' GM. After Sexton was released, Shero accepted the Nashville Predators' assistant general manager's job that was offered by GM David Poile, Bud's son. Just another strand in the huge web of associations that weaves together the NHL. "I think it's an advantage to come through an NHL family," Clarke said. "Ray's mother, Mariette, was just as dedicated as his dad. She's a terrific lady who still comes to games and Flyers events. Ray played in college and tried the pros. He was well prepared for the life of hockey." "I wasn't much of a shooter because Moose Dupont was my shooting coach," Shero said with a laugh. There's one last connection between Shero and the Flyers. R.J. Umberger, the Flyers' tireless forward, was one of the first NHL players produced by the Pittsburgh Hornets youth-hockey organization, along with Penguins forward Ryan Malone. Shero's son, Chris, 12, currently plays for the Hornets. “Chris wore his Hornets jacket to a Flyers game in Washington," Shero said. "He banged on the glass to get the attention of R.J. Umberger and Nate Guenin, another ex-Hornets player in the Flyers organization. Nate and R.J. gave Chris the high sign. "That Umberger is killing us. He's got five goals and five assists against us this year. We're making his year. We've got to shut him down Sunday." Finally, a reminder that the love stops at the door to the rink.